UPDATE 4/30: New photos of prototype added. Not long ago, I brought you word that Chris Vail of Lew & Huey had a new watch on the drawing board that would bridge the gap between the existing Spectre and Acionna models, and deliver a more traditional design with a Lew & Huey twist. 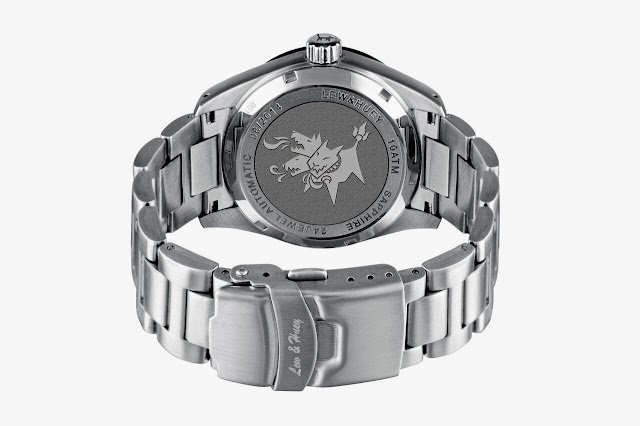 That watch is the Cerberus, available for pre-order now. 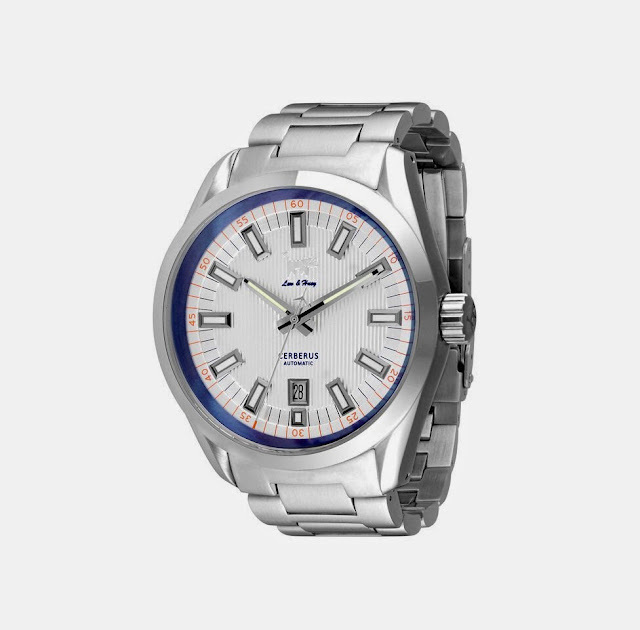 The Cerberus has a sporty look that will dress up easily for business wear. 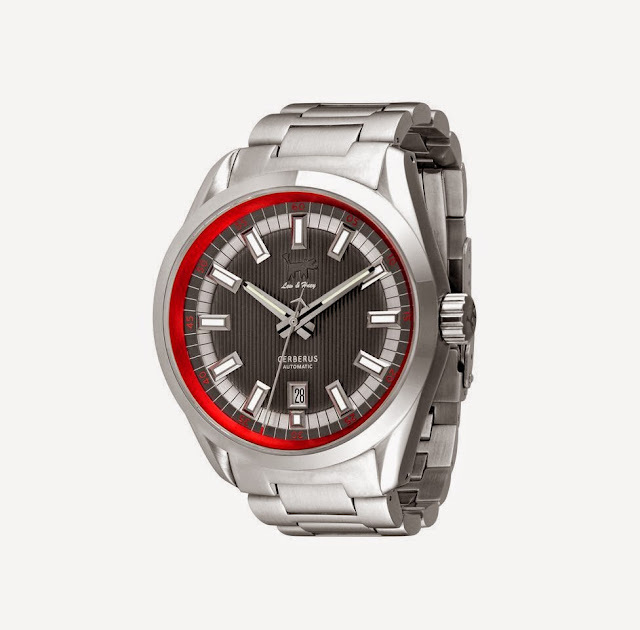 It has a round, 42mm stainless steel case with drilled, twisted lugs and a combination of brushed and polished finishes, and will come on a brushed 316L stainless steel solid end-link bracelet with tri-fold, button-release clasp. Water resistance is 100m. 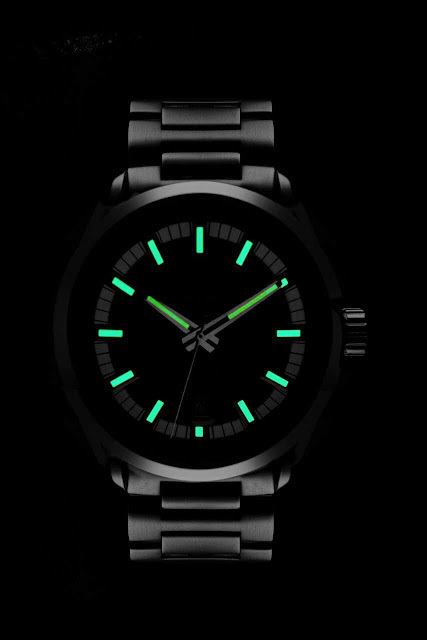 In true Lew & Huey fashion, the watch face promises to be a visual feast. 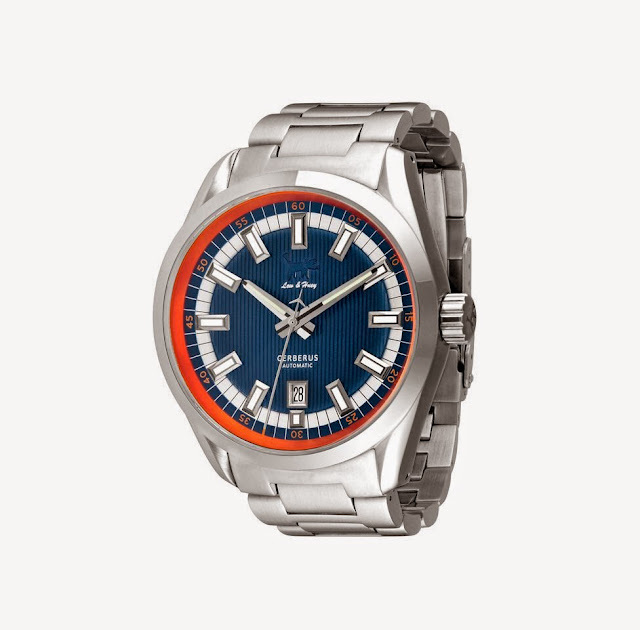 The center section of the dial is vertically grooved, and ringed with a brushed stainless steel minute track, radially-numbered second track, and finally a color-annodized steel beveled chapter ring. The hands and applied markers are filled with the same torch-like illumination as the Acionna. Minute and hour hands appear to be twin tapered parallel bars with the lume pinched between them. The 6 o'clock date window has a stainless frame. The specs and renderings can only hint at what these layers of detail will look like, but they have certainly piqued my imagination. Sparky the dog once again takes his place at the top of the dial, but model name notwithstanding, he still appears to have only one head. A flat sapphire crystal with anti-reflective coating tops it off. 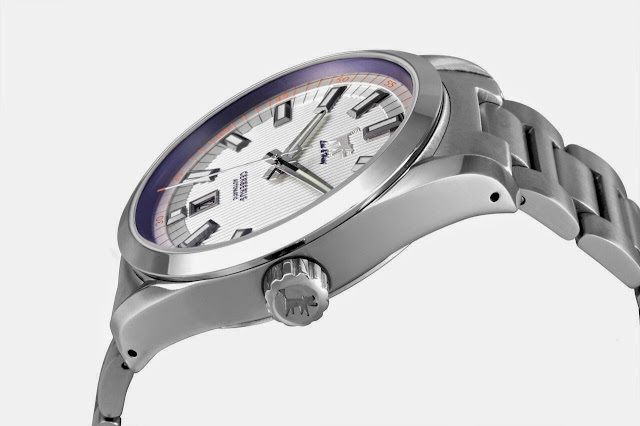 Inside, you will find one of the sweetheart movements of the indie watch world -- the 24 jewel, high-beat Miyota 9015. 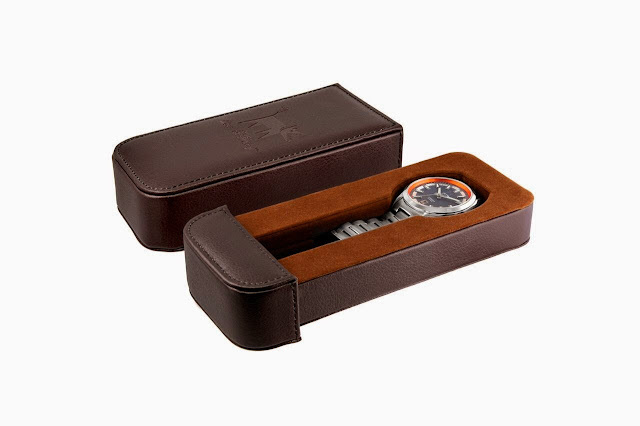 This smooth and dependable unit has hacking and hand-winding capabilities, and a 42 hour power reserve. 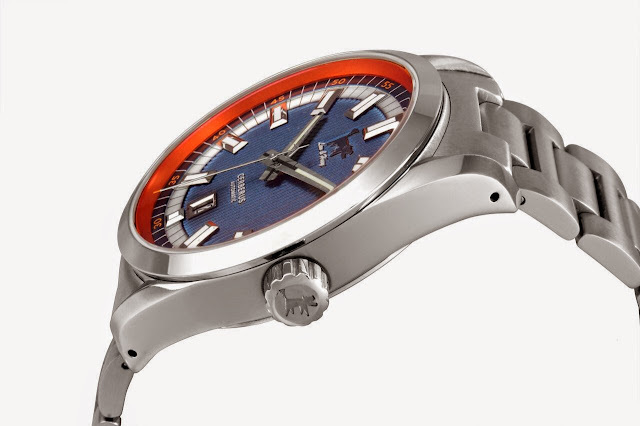 The Cerberus will be available in blue/orange, white/blue, and grey/red colorways. Pre-order pricing is $450 (MSRP $649). Only pre-productions renders are available now, but they look stunning. 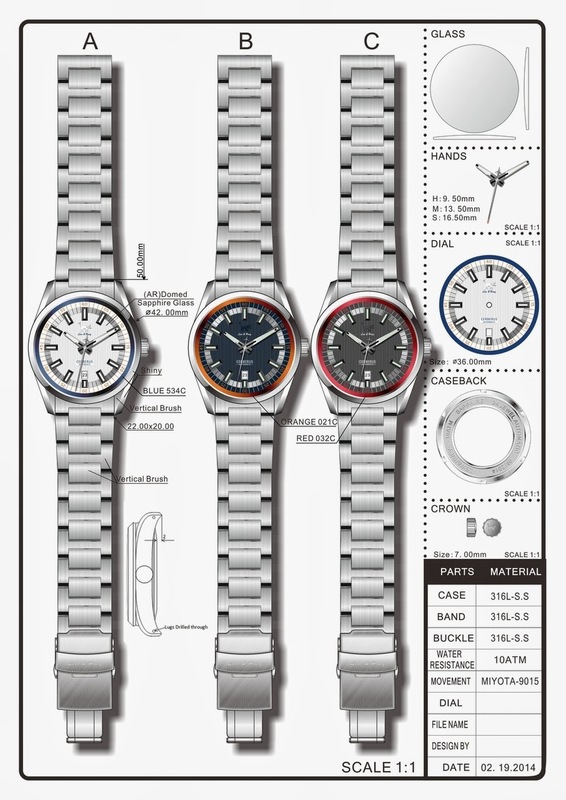 As an added bonus, Chris is currently soliciting input from the watch nerd community for a special case back engraving. Artists are in the process of being chosen soon participants will vote on a specific design. To participate, or just to watch the creative process unfold, head over to this thread in the Watchuseek Affordables Forum. [Update 4/30, the final design has been chosen. See below.] For more info and pics, see the Lew & Huey site and blog.